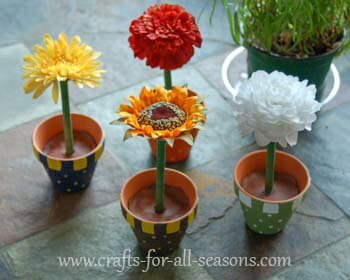 Making these flower pot pens is one of my favorite crafts to do. 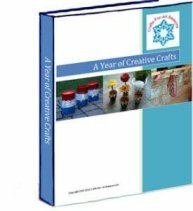 They are SO easy to make, and the result is beautiful and useful. They make great gifts! 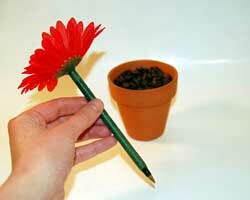 The flower stem is actually a pen, and there are two different ways to fill the flower pot to support this pen. In the tutorial below, I show you can fill a terracotta pot full of coffee beans to be the "dirt", which supports the pen.I love using the coffee beans because they smell good. You can also use dried legume beans as well. The pens in the photo above were a set I made for all my daughter's teachers. Here, I added air dry clay inside the pot, and stuck the pen in to make the hole. 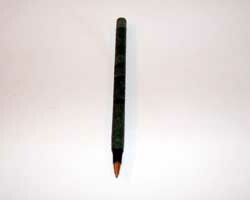 I removed the pen and allowed the clay to air dry. 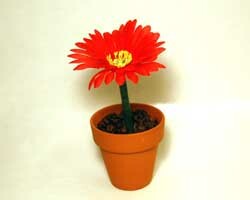 This flower pot pen looks great in the kitchen or the office, and no more fumbling for a pen! You always know where to find one. 1. The very first step is to remove the end of the pen. Make sure you use a straight pen, like Bic, not a pen where you "click" the pen open and close and has a clip on the side. Making this flower pot pen is extremely easy and fast to do, but the hardest part of the whole project is removing the end of the pen. 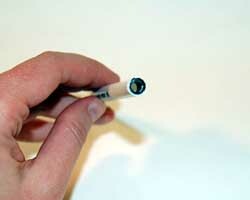 For a Bic pen, the end of the pen is a little plastic disc that must be removed. Wedge a razor blade in between the body of the pen and the edge of the disc to get it to start coming out, then use pliers or tweezers to remove the end. If it won't budge, use the razor blade to cut off the end. 2. 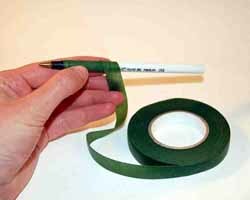 Next, wrap your pen with floral tape. 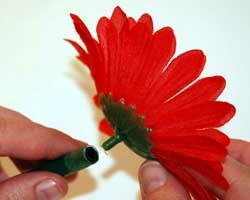 Begin near the ball point tip, and pull the floral tape slightly as you wrap up the pen, overlapping slightly. The tape will stick to itself. When you get to the top, rip or cut the floral tape off and wrap it around itself to seal. 3. Next, pop off the silk flower head from its stem. 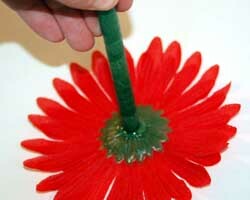 Put some hot glue or super glue around the little plastic stem that remains on the flower head, and push this into the end of the pen. 4. 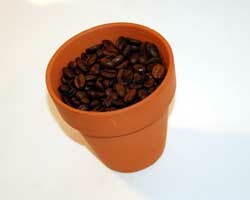 Fill up the flower pot with coffee beans or another dried bean of your choice. Pop the flower in the pot and your gift is ready to give to Mom!